Many of us avoid investing in the stock market because we fear investing catastrophe. Most people likely define catastrophe as “losing all of our money in the stock market.” So we choose to sit on the sidelines. No more. Of course individuals can learn to invest in the stock market. And it turns out many investment decisions are within our control. We can all make solid, practical decisions — those investments that have a “margin of safety” — to help avoid catastrophe. While certainly there are no guarantees, the framework below can help you avoid disaster. Invest Only the Money You May Not Need for A While. Do not invest the money you need to buy food this week. In other words, decide what your cash needs are and then only invest extra money that you will not need for a while. This frees you up to make sound, long-term decisions. Set Rules for Position Size — And Follow Your Own Rules. Make a written plan to decide how much you will invest in any position. Make sure no one position is larger than 4–8% of your entire portfolio. Don’t give in to temptation to break this rule, no matter how confident you are. It is better to lose opportunity than to lose your hard-earned money. Here’s where you can learn to Invest Your First Dollar. Buy With a Margin of Safety. The thriftiest people in the world only buy things when they are on sale. Investing is no different. This fundamental principle of investing means that you should only buy a stock when its price is significantly lower than its true or intrinsic value. Buying really low gives you some cushion in case your assumptions about the investment aren’t perfect — thus allowing your investment to be relatively safe in the long run. Diversify. Decide to invest across several industries and sectors. Do not put all of your eggs in one basket, no matter how good the idea might seem. Spreading your investments around will help reduce the chance of any one investment sinking your entire portfolio. Never Panic Sell. So you made an investment and now you are surprised to see the price has quickly dropped 25%. This is painful, and most of us want to escape pain so we sell immediately to avoid an even greater loss. Stop! Do not panic sell and lock-in a large loss. Take some time to fully review the situation. You may then want to consider setting what is called a “loss limit” to limit further downside, but only after you decide why you would take any action. And remember: since you set rules for position size and you are diversified, even the worst case situation should be manageable. Be Patient and Think Long-Term. Catastrophic decisions sometimes happen when we become emotional and engage in short-term thinking. So be patient when investing. Think long-term. That often means months and years, not just hours, days and weeks. 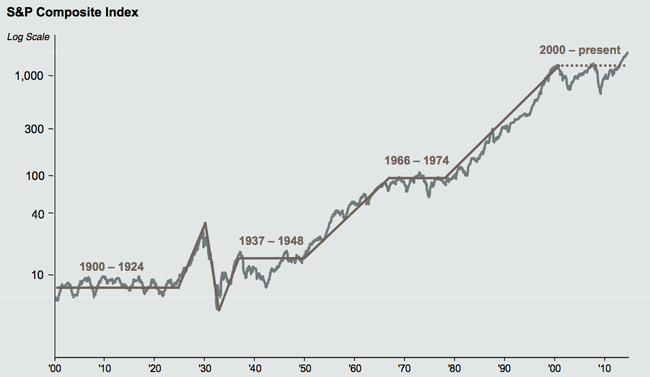 As a reminder, have a look at the graph below: Investing in the U.S. stock market has been a winner over long-periods of time. When we invest in the stock market, we may feel powerless — like results are completely out of our control. But that is not necessarily the case. Making sound decisions based on the advice presented above can add discipline to our investing and help us avoid financial catastrophe. Replicate the world’s best investments from highly successful investors! Sign up for Instavest now.